Hey everyone, it’s Finance Fridays again. 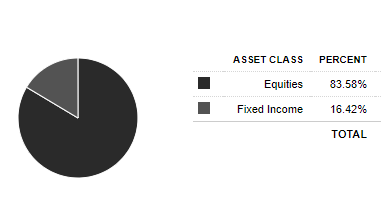 Today I was going to look at my portfolios and see if I needed to rebalance or not. So rather than just do all the work, I’d figure I’d share the data and my thoughts with you guys, without getting into too much detail. 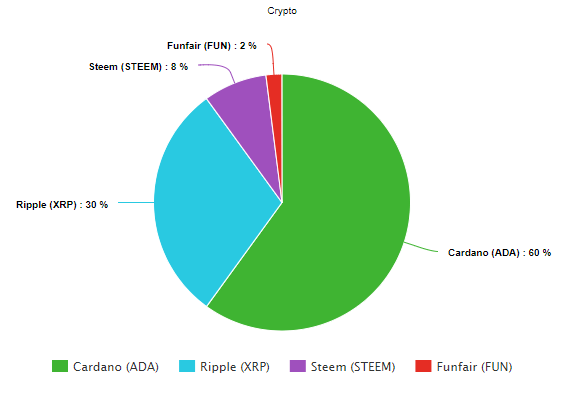 So let’s talk about “My Portfolios for 2018“. I’ve talked about why I’ve chosen this particular allocation before, and people will agree or disagree with me. Basically, it’s a variation of an approximation of the “three fund portfolio“. It’s an 80/20 split of stocks and bonds, which is aggressive for age. It’s essentially an “age – 15” in bonds portfolio. 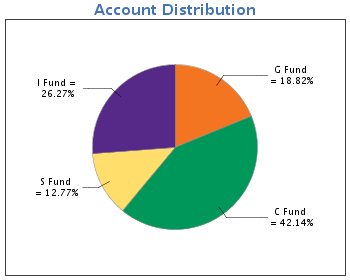 Then I’ve split up the 80% stocks into 50% C fund (large cap), ~33% I Fund (international), and 17% S fund (small cap). This ends up being 40% C Fund, 27% I Fund, and 13% S Fund overall. My 20% bonds aren’t technically bonds, they’re government securities, in the G Fund. For a better explanation of what each fund holds, you can go here – Investing in the TSP: The Individual Funds. This last year we’ve continued to show gains, which is explains why my C and S funds are a larger proportion of the allocation, whereas the G fund is now a smaller proportion. This doesn’t really need its own pie chart, but I’m including it for completeness, and because I like pie charts. The 457 option we had didn’t have very good options for funds. 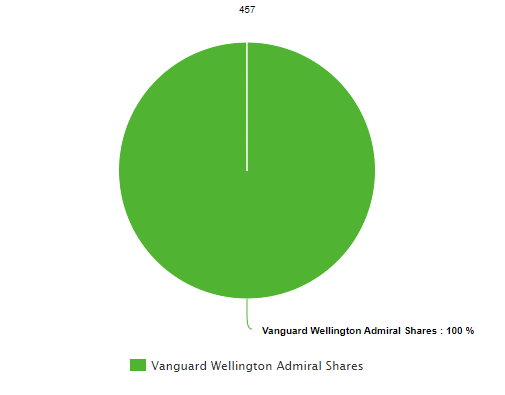 Also, since it isn’t/won’t be a huge portion of our overall retirement portfolio since we can no longer contribute to it, I decided to throw it into a good “balanced fund” with Vanguard Wellington Admiral Shares – which is ~65% stocks, 30% bonds, and 5% reserves. Some people use Vanguard Wellington as an “all in one fund”, and to be honest, it’s not a bad option. Although I consider it somewhat conservative for younger people, and then becomes too aggressive as you get older. At some point in future I will move this into a different fund. This is basically a 3 fund portfolio. I think when I originally made it, I made it 33/33/33 or maybe it was 70/30, which was more conservative than the 457 and my TSP at the time. I think I did this to somewhat balance things out. However, because of the gains in the stock market over the last few years, it has kind of fallen out of balance. I should probably take this time to rebalance it. I also don’t really like that I have so much international tilt in this portfolio. I haven’t decided what to rebalance to. I may just go back to 33/33/33 just to keep it simple. Or, I may make it more similar to our TSP and go 80/20, with less of an international tilt. We’ll see. Now these ratios aren’t horrible, but they’re significantly higher than Vanguard. In the two accounts, it’s 80% Equity R1 and 20% Bond Market R1. In the other account, it’s 80% Equity Index and International Equity Index and 20% Total Return Bond. However, because the market has been doing well, they’re all closer to 84% and 16%, and should be rebalanced. 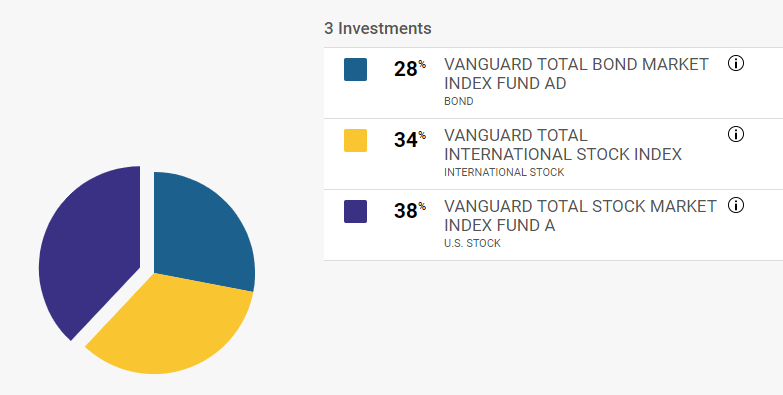 I wanted to see if any new Vanguard funds were added, but unfortunately no. I may go through all the offerings again at some point, but I am not hopeful to find anything better. Her fellowship 403b, even though it was TIAA CREF was actually very good – Vanguard Funds. This was an 80/20 split, but has now become 84/16. I should probably rebalance this soon as well. So… obviously I need to rebalance here. Just to keep everything similar, whatever I decided to rebalance the other Vanguard funds to, I will do the same here. This is a good lesson. Make sure you rebalance on a regular basis and check out any new funds offered. Retirement funds change all the time, funds are changed and replaced often. What about your Crypto Portfolio? My crypto portfolio is miniscule in comparison to the rest of my retirement accounts. Only invest (gamble) what you can afford to lose. And there ya go… that’s how you look at your accounts and try to rebalance things. Don’t miss the forest through the trees. Stay the course. Take stock of your retirement funds on a regular basis. Don’t forget to rebalance based on your retirement plan. Check to see if new better funds are available.